Tax-Free Retirement by Patrick Kelly is reviewed by our guest writer Dan Ruger. What could I possibly stay away from, given my pretty busy day, to read about retirement? Tax-Free Retirement seemed like a boring lecture at first glance, but given the shroud of laudatory snippets that haloed the book I opened it and went with it to the end. An emotional roller coaster, an eye-opener, and far away from a novel, the numbers the book gives are daunting as is the realization of financial ignorance. I would look at it as a confrontation between Goliath and David, and David’s not winning. Not now, not ever. However, there’s a way to make David survive and keeps Goliath at peace as long as there is tribute. And there’s where Patrick Kelly comes in with his book and shows us, the Davids, how to keep most if not all of our tribute from being hoarded by Goliath, the mask that hides Uncle Sam. That being said, you have a pitch for life insurance beautifully laid in front of you. Nothing wrong with that; even more, it is presented as an investment due to the generally unknown tax benefits of a well written life insurance policy. The author – who drew policies of this sort in his career – fairly cautions the reader on getting advice from reputable firms and agents in order to have a well put together plan and not just satisfy the sale figures of some avid business. How appropriate this is, given today’s economic quagmire. And although the interest rates cited in this book are just memories of a better past, we still have to think of our financial future. All in all, “Tax-Free Retirement” needs to be read; it helps paint the big picture and gives a unique and viable perspective on your financial past, present and future. Want to win your own copy of the National Best-Seller “Tax-Free Retirement”? Carp(e) libris reviews is giving one away! 1.) 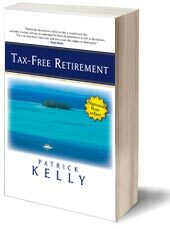 Just visit the Tax-Free Retirement site and tell me something you learned about Patrick Kelley’s book. (You may enter once a day – following entries don’t require you to answer the question.) Remember, leave an interesting comment. If I cannot contact the winner, you might be chosen instead based on your comment. Feel free to do all four to gain several entries to win! You have until midnight EST on Wednesday, February 18, 2009, to enter. I learned that it became a National best seller in just a few short months. I subscribe by email. Thanks. I like the comment to get investment advice from reputable firms. Are there still some out there? I guess I need this book since I am retired. Both consumers and insurance and finance professionals are raving about this book and its concepts. They said it is so fascinating that you can’t put it down. That does sound unique for a book on finance. Books on insurance and finance are usually rather dry reading! Before you know it, retirement will be here. I’d love to learn some advise beforehand. Thanks! I like that it is a simple read. Thanks for the chance. I learned that the rave reviews aren’t just coming from industry professionald, but from clients as well — high praise in this day of financial skepticism. would be very helpful to me and my husband and to my parents.thank you. The fact that reviewers find Tax Free Retirement easy for the average person to understand is reassuring. Fear holds people back. I learned that he also has dvd’s for sale. I subscribe – thank you! WOW! Wouldn’t that be great! Thanks! This will help both me and my kids. I’ve learned that it’s been lauded as a new landmark in financial books amongst books such as ‘The Wealthy Barber’ and ‘Rich Dad, Poor Dad.’ If it makes sense to the average individual, then I’d love to read it. Please enter me into the contest. Thank you! A national best seller in just a few weeks. This must be a good read. Thanks! This book explains the many benefits of life insurance. I will give it to my partner. Its seems like an interesting book. Hope I win so i could read it. Since our wonderful leaders in Congress have pretty much guaranteed me an income free retirement with their incompetency and lack of oversight a book on living Tax Free would be an appropriate companion to my retirement. Hope I win this one. Thanks. This will help both me and my kids again! I learned that it’s about taxes. Stephen Saunderss last blog post..Do female blog owners appreciate their male readers? I learned that it became a Best Seller in a very short time. It must be good. We may be needing some of the advice sooner than we might like. This is my entry for February 14, 2009 please… I’d really love to read this book, especially in this economy where I fear retirement is getting further and further away from my goal. Thank you!